Quoted prices prior to puppies coming in are estimates and subject to change at any time. Welcome to Spa City Puppies! Our business has been in operation at the current location since 2009. We are inspected and licensed by the City of Hot Springs, visited by USDA inspector and registered with the Department of Health with the State Of Arkansas. 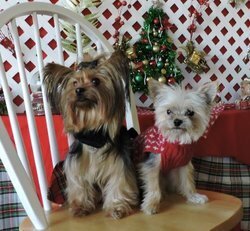 We are a family owned and operated business with 15 years breeding experience offering primarily smaller Toy Breeds and many of the "Designer", hybrid puppies. They will be at least 8 weeks, vet checked and up to date on all shots, vaccinations and de-worming required for their age. We follow the most thorough vet recommended health program you will find and is proven by overall good results. The purebred puppies will come with a registration application from a major pet registry either ACA, CKC, APRI or AKC. Also the "Designer" hybrid puppies may have a registration application for either ACHC or ICA. Our puppies are sold and intended for PETS and we do recommend you get them spayed or neutered for overall health as well as helping control an unwanted dog population. Available puppies are shown under the page for the current month, it is kept VERY current so what you see "should" be available. Photos from the past couple of months are left up so people can see or get ideas as to what they might like. When possible I post the puppies coming up on the "Upcoming Puppies" page where they can be reserved in advance if it is what you are looking for. For those of you that are not familiar with our puppies check out the "Past Puppies Pics" page to see some the puppies that have gone on to their new homes. We strive to assist a family in choosing the pet that might best fit their family's situation. Many concerns people have is non/low shedding, approximate size as an adult dog, does it do well for kids, get along with other dogs, common health issues and many other questions. With the hybrid puppies you get lots of different looks, colors, improvements over purebred issues and as general an overall fewer health problems. We have different ones quite frequently. We cannot guarantee exact adult size, weight, coat or temperament, however we will give our best "estimate" knowing what we may know about the parents. Also we have high quality Iams food that the puppies are being fed and raised on. It is "CRUCIAL" to keep a new puppy on the same food for a period of time so it will get off to a good start in it's new home. We also have doggie clothes, crates, carriers, beds, perfumes, bowls and other items for your new puppy going home. Visitors coming in the shop are required to sanitize their hands prior to any contact with the puppies. We strive to see that the puppies are protected the best we can so we appreciate compliance in that regard. Arkansas Sales Tax will be added to the price of the puppy. We suggest you check with your local shelter or adoption agency for a dog before purchasing a new puppy.